Simple gameplay. One person lays down a card that has a sentence with a fill-in-the-blank space in it. Other players lay down a card with a word, phrase, or name that they think the first person will find most amusing in that space. Anybody, no matter how doltish or drunk can figure it out, which makes it extremely effective as a party game. It lets people say “offensive” things while being able to hide behind a game. We’re living in a culture that views saying or doing something “offensive” as an unpardonable sin. If you’re highly politically correct, this game provides an outlet to spray all the repressed opinions you’ve been saving up that you were too afraid to voice in any other context. For those two little reasons, this is almost a perfect game for the general public to pull out once or twice a year at an alcohol-fueled gathering. It’s also why I loathe it. The simple gameplay means that no skill is required, the only thing that gives you an advantage is knowing the other players better than everyone else (being the host who invited all the guests to a party gives one a distinct advantage) or being lucky enough to have the card that provides the most nervous “is it okay for me to laugh at this” laughter. The appeal while playing is the “naughty” answers repressed millennial hipsters can give without getting dirty looks, which either becomes tiresome as the novelty of acceptable racism (or talk about dead babies or whatever) wears off, or just starts out boring if you don’t remotely care about policing your thoughts in the first place. So, go ahead and play if you’re a drunk normie, but if you’ve ever listened to George Carlin, Richard Pryor, or Lenny Bruce without clutching your pearls you’ll be bored out of your skull by this. Another great game brought to us from Kickstarter. Cards Against Humanity has been a staple at our house for years. This game is definitely for the 17+ crowd. Those younger or less inclined to make jokes about lewd, crude, and rude topics should stick to Apples to Apples. This is a great party game best played with about 5-8 people. Any less and it becomes to fast paced. Any more and it tends to drag and people lose focus. Each expansion, booster, and promotional offering I’ve found to be fantastic additions, including fun pop culture references that just everybody should “get”. The only downside I’ve found would be replay. After a while, the shock value is diminished due to repeatability. A sad thing that affects many similar games. However, if you change up your group and get fresh, or better yet, new people to the game, it resets everything and hilarity ensues. All in all, this game is reasonably prices and can be picked up in most brick and mortar stores and also online. Once thing I’ve noticed about their expansions is that they’ve discontinued the Expansion 1-6 boxes and moved toward three color boxes (Red – Expansions 1-3; Blue – Expansions 4-6; Green – Brand new set of 300 cards). I check every month or so to see if they’re running any special promotions, there is usually something over the holidays and during the summer. Gameplay Gist: People take turns being ‘the judge’, who reads out a prompt from a black card. Everyone else plays a white card from their hand in response to the prompt. Then the judge shuffles the white cards, reads them aloud and picks his/her favorite, and the person who played that white card wins the round (and receives the black card). After a predetermined number of rounds, the person with most black cards wins. However, the real point of the game is the shock value, as all the white cards have crude/shocking/random phrases on them. For example, for the black card “What are my parents hiding from me?”, someone might play “Harry Potter erotica”, then people laugh. Ok, but is it good? The first time I played this, I laughed so hard I cried. The second time was almost as fun, but by the third time (when I’d seen most of the cards) I was so so bored. Now, whenever it’s brought out at a party I make some excuse to leave. But even with all that, I do think it gets stale rather quickly and there are many other good party games out there! My suggestion would be to play it once at a board games cafe (towards the end of the night when people have had a few) and then just leave it there. 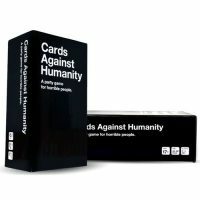 Add a Review for "Cards Against Humanity"